On Saturday, February 23, 2019, archaeologist Homer Thiel will lead a tour of the Presidio of Terrenate and the Fairbank Townsite. Tucson Presidio’s “sister” Presidio of Terrenate was constructed near the west bank of the San Pedro River in 1775. It lasted only five years and suffered from isolation and raids. Mr. Thiel will describe what life was like at Terrenate, and an included boxed lunch will be enjoyed under the cottonwood trees at what’s left of the town of Fairbank. 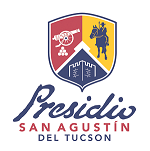 Attendees will carpool from the Presidio San Agustín del Tucson Museum at 8:00 am (196 N. Court Ave. in Tucson). The fee is $30 per person ($25 for Presidio members). Pre-registration is suggested at www.TucsonPresidio.com. For more information contact April Bourie at 520-444-3687 or aprilb@tucsonpresidio.com.